When Washington state wildlife officials announced they would eliminate the Profanity Peak wolf pack last month, they were operating under a new management plan. The plan came about after months of deliberation with various stakeholders ranging from livestock producers to conservation groups. But there were some parties left out of the discussion. Correspondent Emily Schwing reports. WAG members include cattle and sheep ranchers, private citizens and other conservation and animal rights groups like Defenders of Wildlife and the Human Society of the United States. But some organizations believe WAG members have compromised too much when it comes to wolf recovery and conservation. Roughly 80 people gathered at the state capitol to protest the state’s decision to shoot and kill the entire Profanity Peak Wolf Pack. There are other groups that have also been left out of the conversation. 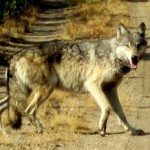 An elder from Western Washington’s Cowlitz Indian tribe complained that exterminating the wolf pack violates native American treaty and religions rights. According to the Attorney General’s Office, Washington’s Department of Fish and Wildlife is operating in compliance with federal and state law. As for tribes, “there are no tribal courts that have any subject matter jurisdiction over these management actions,” wrote Niel Wise, Senior Counsel for the Attorney General, in a letter dated August 29th. The US Government and tribal leaders signed treaties in the 1850’s so that tribal law applies on tribal land. Essentially, Indian reservations are independent nations. Washington’s stakeholders plan to review that state’s wolf management protocols this winter. In Oregon, state wildlife officials also heard from stakeholders. A 2010 report describes those comments as “highly polarized.” The state killed four Oregon wolves from the Imnaha pack last spring. Idaho’s wolf management plan allows ranchers to kill wolves that kill their cattle. You can find more information on Washington’s Wolf Conservation and Management Plan here. The 2010 Oregon report mentioned in the story can be found here.